Viking Books for Young Readers, 9780670784912, 192pp. 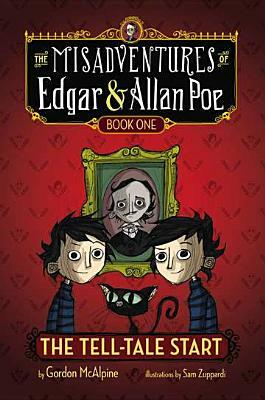 Meet Edgar and Allan Poe -- twelve-year-old identical twins, the great-great-great-great-grandnephews of Edgar Allan Poe. They look and act so much alike that they're almost one mischievous, prank-playing boy in two bodies. When their beloved black cat, Roderick Usher, is kidnapped and transported to the Midwest, Edgar and Allan convince their guardians that it's time for a road trip. Along the way, mayhem and mystery ensue, as well as deeper questions: What is the boys' telepathic connection? Is Edgar Allan Poe himself reaching out to them from the Great Beyond? And why has a mad scientist been spying on the Poe family for years? With a mix of literary humor, mystery, a little quantum physics, and fun extras like fortune cookie messages, letters in code, license plate clues -- and playful illustrations thoughout -- this series opener is a perfect choice for smart, funny tweens who love the Time Warp Trio, Roald Dahl, and Lemony Snicket. Gordon McAlpine is the author of adult novels ranging from magical realism to hardboiled literary mystery. This is his first work for younger readers. He lives with his wife in Southern California. His Web site is www.gordonmcalpine.net.